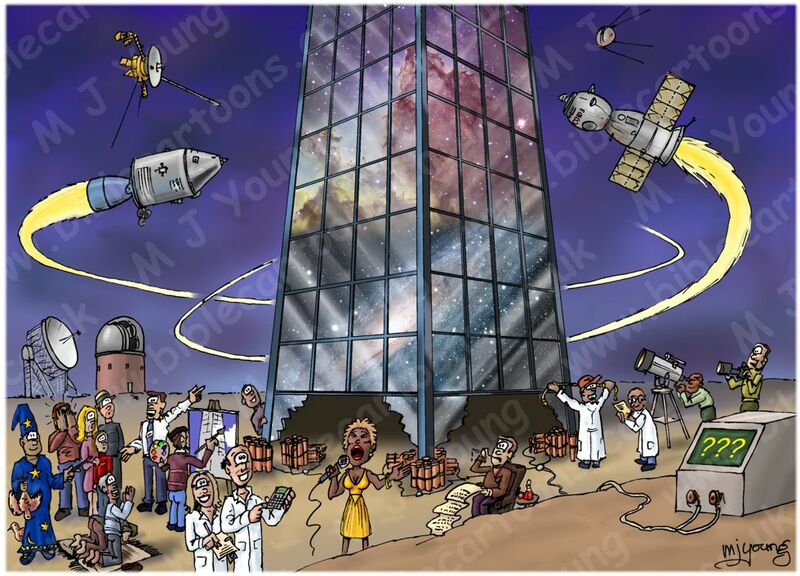 Bible Cartoons: Cosmos as building metaphor: the end is near? Cosmos as building metaphor: the end is near? Cosmos as building metaphor – without glazing so you can see the Heart nebula & the Andromeda galaxy in all their glory! This is a metaphor scene I’ve been meaning to draw for a few weeks. It ties in rather neatly with my last blog post, which was about 1 Peter 4:7-9 *1 & the “end is near” statement. My picture shows the whole universe (cosmos) represented as a building, in the middle of the picture. Through the glass you can see the Andromeda galaxy & the heart nebula: representatives of galaxies, nebulae & star clusters – all that makes up our universe. The whole, vast cosmos is represented by that central building, with people around it, looking at it. The purpose of the illustration is to question some of our human reactions to the universe. If you look closely at the drawing you will see that there are explosives set around the base of the building, all wired up to a box in the right foreground, which is a timer/detonator. The three question marks (???) on the box show that we don’t know when the explosives will be detonated, & the building/cosmos destroyed. This uncertainty about exactly when the universe will be brought to an end relates to what the Bible tells us. Matthew 24:36 (ANIV) says, “No-one knows about that day or hour, not even the angels in heaven, nor the Son, but only the Father…” *2 And 1 Peter 4:7 (NLT) states, “The end of the world is coming soon…” *1 many Christians believe we are in the “end times” right now. Bearing in mind that this wonderful, dynamic, beautiful, vast universe IS going to be brought to an end (see Revelation 21-22), you have to ask the question “is it a good idea to expend your life time studying it?” Scientists make careful & painstaking measurements about so many aspects of the universe. 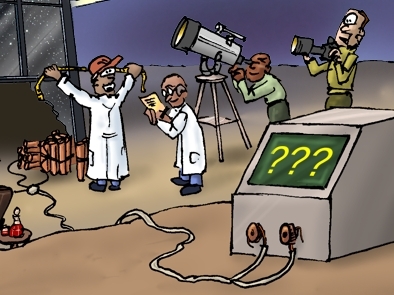 We’ve built telescopes to look at it, satellites to probe it, & thought up many theories about how it all got started. If scientists, astronomers, cosmologists, physicists, philosophers, etc spend ALL THEIR LIVES studying the universe, & then it goes bang, & is replaced by another different one, isn’t all that painstaking work; the result of a life time’s study, going to be rather pointless? These scientists & philosophers will have a lifetime’s worth of careful observations & data on… something that doesn’t exists any more. How useful will that be to them, or us? When the universe is replaced, there will have to be new observations & measurements made – the “old” universe’s data won’t be worth very much! I’m not saying that taking careful measurements, observing, & even theorizing about the universe is a bad thing. I’m a fan of science & technology, after all. Carefully observing the cosmos & recording what you find is a noble pursuit – no arguments from me there! Observation goes hand-in-hand with awe; & our universe IS awesome! Astronauts who dedicate their lives to training in order to get into orbit; technicians & engineers who create spacecraft to get them there; it’s all good! These are brave, clever, far-sighted, brilliant people. Even the financial cost of space exploration is only a tiny fraction of a countries’ annual budget – so there should be little complaint about that either! All I’m wondering really is, how SENSIBLE is it to dedicate your whole life to the pursuit of knowledge about, & the exploration of, something which is going to be destroyed. It’s a bit like pouring all your love & life time into restoring a classic car, knowing that at some (unknown) time in the future someone’s going to grab that car you love so much & stuff it into a car crusher! HOW WOULD YOU FEEL AT THAT TIME? So my suggestion would be, by all means use some of your precious life time in the pursuit of knowledge about the cosmos, but above & beyond that, make your primary purpose about getting to know the Creator of the universe. Unlike the cosmos (which will end & be replaced) we know that God is unchanging, because he is perfect. The pursuit of knowledge is good, IF it leads you to an ever greater appreciation for the Grand Designer of the universe. This universe WILL be destroyed, and all the people who have dedicated their amazingly precious life time to observing, measuring & unlocking of the universe’s secrets, will realise that this information then has no value, since it describes something that no longer exists. But this question of studying the universe is really about time: the scientists, engineers & philosophers who study the universe do so at a PERSONAL, LIFE TIME COST TO THEMSELVES. If they use up their life time in pursuit of studying the cosmos, then they obviously have less time available for any other activities. I imaging that someone who is intent on unlocking the universe’s secrets does so at the cost of some other pursuit(s). Of course it is possible to “juggle” one’s life time in terms of work, home, family, friends, hobbies, etc. I’m not suggesting that a scientist necessarily suffers as a result of his/her study, nor does his/her family necessarily “pay the price” of their absence from home. I suppose I am merely commenting on the inevitable conclusion that the life time used in pursuit of cosmic observation, once that universe is gone, may be regarded as “wasted” life time, which would be regretful. This universe IS amazing, it IS beautiful, it IS vast & complex. Studying it is a natural, sensible, desirable thing to do – I get that. My point of departure from this study is consideration about origin, & creation. As a Christian I see the creation (the cosmos) but I believe in a Creator, our heavenly Father, even though he is unseen. Since he is unseen, no amount of scientific study is going to show him! It’s a matter of faith, rather than observation & measurement. I guess my real observation in all this is that it makes more sense to me, as a Christian, to enjoy the Creator, than to study the creation/cosmos. Whilst studying the universe makes sense, & is enjoyable & fulfilling in itself, it is not the ultimate priority for me. Relating to the Creator, rather than only focussing on his creation (the cosmos) makes the most sense to me. You can read my thoughts about each of these (see below), if you want to. Cosmos as building metaphor – Close-up of the group on the left of the scene. This is a close-up of the people on the left of the scene, who are expressing various emotions. There is a person covering his/her face, which is representative of fear or rejection, or being overwhelmed. 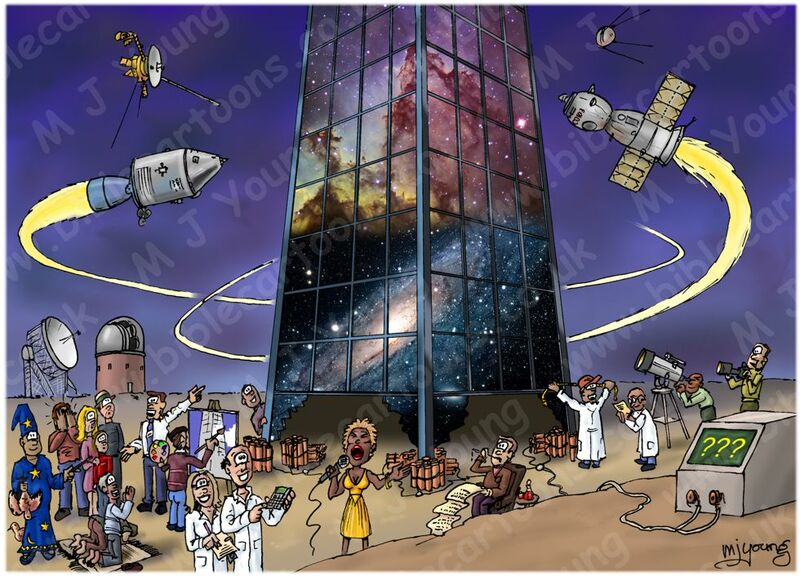 The counter-point to this rejection reaction is seen in the man in purple who is behind the building; “up close & personal” is his response to the cosmos! Next there is a family (husband in hat, woman in pink dress & boy in red jumper) who are all gazing in wonder. They are listening to a man in the white shirt & tie who is talking about the universe/building – perhaps he is an expert, bringing his thoughts & observations to bear on the subject? Cosmos as building metaphor – Close-up of the group on the right of the scene. This is a close-up of the people on the right of the scene. We have representatives of the sciences, measuring the building (with a tape measure! ), a person looking at the cosmos through a telescope, & a person with a camera, photographing it. All are human reactions & means of relating to the universe. Cosmos as building metaphor – Close-up of the singer & poet in the centre of the scene. 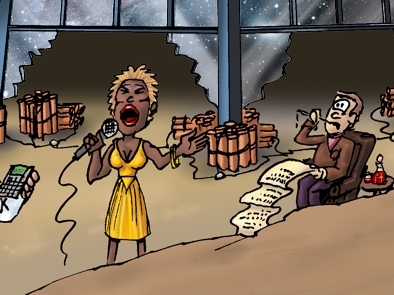 This is a close-up of the centre of the scene, where I have drawn a singer, who is belting out a song about the universe. Singing is another human reaction which I was keen to include in my collection of human responses to the cosmos. The singer represents all performing arts. Another reaction is literary response, in this case, I have drawn a poet who represents all literary output in relation to the universe. Comments of our human reactions & responses to the cosmos, represented by the people in my picture. I suppose the most universal human response to the universe is probably awe & wonder. Human beings seem to have a predisposition to wonder & marvel at things that they see, such as a sunrise/sunset, an impressive cloud formation, or a striking landscape. On a grander scale I suppose we have always looked up at the stars & wondered what they are. In my scene there is a little group of people on the left who are expressing various emotions as a salesman type man (in white shirt & tie!) points out the building to them. You can see a person covering his/her face, which is rather a negative reaction to the universe! I suppose fear, rejection, or not looking at all, are all possible responses! Next we have a family (husband in hat, woman in pink dress & boy in red jumper) who are all gazing in wonder. There is a man in a purple who is behind the building. “Up close & personal” is his response to the cosmos! 02) Measurement, observation, the sciences. One way to react or respond to the universe is to use the sciences. I’m a fan of the pure sciences, which deal with measuring, recording observations & repeatable experimentation as means of understanding & investigating the cosmos. Science is a powerful tool to use in the pursuit of determining what is “out there” in the universe. It is certainly much vaunted these days! 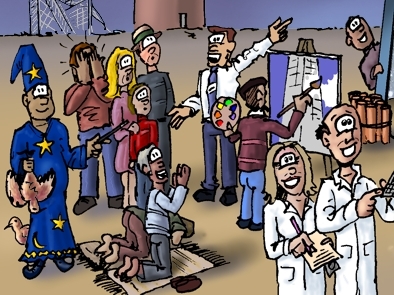 “Measurement” is also represented by the two people in lab coats in the foreground. The man has a calculator & the woman is recording his calculations. “Measurement” is further represented in my drawing by the two men at the base of the building on the right of the scene, one of which has a tape measure & is telling his colleague (the man with the clip board) his data. Where science aims to accurately measure the cosmos (distances, sizes, mass, speed, etc) I have no problem at all. The difficulty for me comes when pure, measurable science becomes blended with philosophy. By philosophy I mean something which is a thought or assertion, but which is not measurable, thus un-provable. Much of modern cosmology & the theory of macro-evolution (from fish to man), etc falls into this disreputable bag! By all means theorize, but don’t try to pass off your theory as so-called “scientific fact”! I’ll get off my soap box now! “Observation” & the recording of what we see is represented by the two observatories on the horizon (left hand side of my picture). One observatory is the classic domed building housing a visible telescope, the one to the left is a radio telescope, that detects & records radio frequencies. “Observation” is further represented in my scene by the man on the right of the building who is looking though a telescope, & the man on the extreme right has a camera, so he represents both “observation” & “artistic expression” in response to the universe (see below). “Observation” I have no problem with at all. If we can see it, then maybe we can measure it, & in that case we can assert facts about it. I have drawn various spacecraft, zooming around the universe/building, which represent our technical response to the universe & our desire to “get out there” into space exploration. On the left at the top is Voyager II, the space probe that has now left the Solar System & is bound for interstellar space. Below that is the American Apollo Command Service Module, part of the spacecraft that flew men to the moon. On the right of the building, at the top, we have Sputnik I, the first Russian artificial satellite put into orbit. below that is a Russian Soyuz TMA-7. A different way of responding to the universe is through the arts: the visual arts (drawing, painting, etc) the performing arts (theatre, drama, dance), literary arts, etc. I have a few representative of this artistic expression in my picture, there is the painter on the left of the scene, who is using an easel & canvas. There is a singer in a gold dress belting out a tune in front of the building. There is also a poet or playwright, who is to the right of the singer, sitting in an arm chair with a long roll of paper on his knees, holding a dripping ink pen to his mouth! No doubt he is waiting for some more inspiration to arrive! Recording what we see, or what we feel in response to what we see, hear, taste, etc, are all valid means of “getting to grips” with the universe. As I pointed out in the science section above, the man with the camera fits into both the “observation” & “artistic expression” categories, as a response to the universe. Another means of responding to the universe is religious expression. There are a great many religions, so this is perhaps the most “universal” response to the cosmos (pun intended!) In my picture “religious expression” is represented by three figures in the foreground, on the left of the scene. There was no way that I could represent all the various religions in one picture – nor do I need to. The two people bowing down in pray on prayer mats are representative of all religious adherents, regardless of any particular religion. To the left of them is a man in a blue robe with stars & moons on it, holding a “magic” wand & a chicken! Note there is another chicken behind him, hoping to make an escape! The blue robed man represents pagan religions, or practitioners of magic: sorcery, witchcraft, wizardry, etc. Almost all religions are intended as a means of currying favour with certain deities, or else trying to manipulate the outcome of “life”. Before scientific endeavour, human beings often resorted to various religious practices as a means of trying to understand the nature of the universe & their place in it; more especially trying to control the unseen forces that they believed controlled their fate. The Christian Bible is very clear about the outcome of people who pursue magic, sorcery, etc – their fate is to be thrown into the lake of fire described in Revelation 21 *3. There is good news though – if you are someone who practices these magic arts. Repent & turn away from these idols. Turn to Jesus, & he will forgive you your past sins. Thus you can escape the lake of fire *4. Nowadays science itself has become, for many, a type of religion, in that it is invoked in the media. When someone says something is “scientifically proven” we tend to believe it, even though the science may not be supporting that statement! People use the “science” word as a sort of short-hand for “don’t doubt what I’m saying” & we often fall for it. One problem with science these days is that many people do not understand what is actually being proposed by science-philosophy & it’s ardent advocates. 36 [Jesus said] “No-one knows about that day or hour, not even the angels in heaven, nor the Son, but only the Father.